A meeting of the fuel and energy industry was held in Ashgabat under the chairmanship of Deputy Chairman of the Cabinet of Ministers Myratgeldi Meredov, the State Concern Turkmengas said in a message Aug. 6. 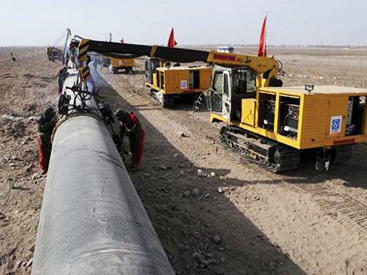 The meeting reported about the measures taken to implement the initiatives to diversify routes for the export of energy carriers to world markets, in particular, the construction of the Turkmenistan-Afghanistan-Pakistan-India (TAPI) gas pipeline, which is being carried out in accordance with the plan. Construction of the Turkmen section of the Turkmenistan-Afghanistan-Pakistan-India gas pipeline was launched in December 2015, while the Afghan section - in February 2018. Turkmen gas is expected to be supplied through TAPI during 2019. The possible project costs on TAPI vary from $7 billion to $10 billion. Being the leader of the international consortium TAPI Pipeline Company Limited, Turkmengas performs the function of the main financier and manager of the project. The consortium also includes the Afghan Gas Corporation, Pakistan’s Inter State Gas Systems (Private) Limited Company and India’s GAIL. The consortium, with the participation of Asian Development Bank, continues active negotiations with all interested parties. Various options for participation in the project are being studied, such as share participation, project financing, financing through international development banks and with the help of export credit agencies from around the world. The total length of the pipeline, with a capacity of 33 billion cubic meters of gas per year, will be 1,840 kilometers reaching the settlement of Fazilka on the border with India. TAPI will export fuel from the Galkynysh gas field in Turkmenistan, which is the second largest in the world.